Manga. We already know that they're one of Japanese culture. These days, we can easily find manga such as in bookstore or in internet. There are many person that interested drawing manga. 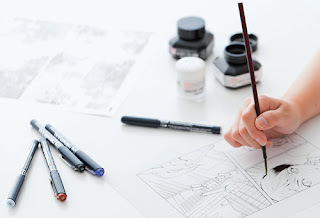 It might be not easy, but there are so many media right now that can help us to draw manga. And here are the basic materials for you who wants to drawing manga. Some tips first: make sure you're comfortable with your materials and also give you the best result, if the materials too pricey, you can try some standard quality and you can be comfortable with. First, you need pencils. Pencils vary in hardness. You'll need a variety of pencils here, but for the beginners, I suggest you for using the HB pencil since it'll easier to erase later. You can use traditional, mechanical or technical pencil, just choose what you're comfortable with. Second, paper. You can use it from your book, notebook, or maybe scrapbook. It'll be better if you using book that has no lined. Third, erasers. I suggest you don't ever use eraser that has a strange shape or color, because it is hard to erase and it can ripped you paper. Use some white vinyl eraser or kneaded rubber eraser. Forth, pens. When your skills already improve, you'll need some inking pen to make it look more professional don't you? Try to match the pen with your paper so it'll not smudging or bleeding so be careful. And for some optional materials, maybe you'll need sharpener, colored pencils, watercolors, markers, or maybe you can draw your manga from computer software! Practice makes perfect. If you keep practicing, I'm sure your drawings will be more better. And make sure to choose the materials wisely.